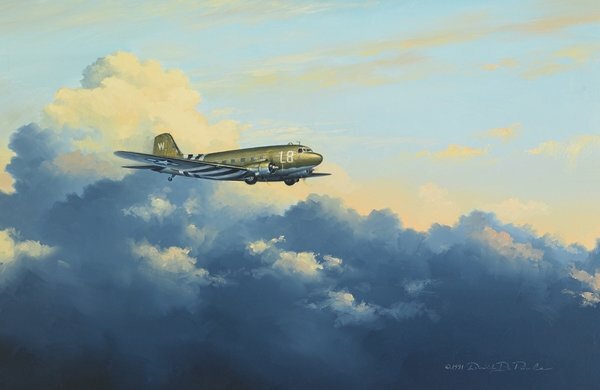 Image Size: 25" X 16.25"
Paper Size: 30" X 21.25"
The DC-3/C-47/R4D/Dakota along with many other names and variants has had a rippling effect throughout the Aviation World for over 60 years. The DC-3/C-47 has touched the lives throughout the world from every country and from Pole to Pole. It was designed to do the work of the world then - and still does much of it to this day. The Douglas C-47 Skytrain or Dakota was a military transport version that was developed from the Douglas DC-3 airliner. It was used extensively by the allies during WWII and remained on the front line through the 1950's with few remaining in operation to this day. This particular "Gooney Bird", as many called her, is seen here with D-Day stripes, one of its' many paint schemes, painted on C-47's around the time of the liberation of France from the Germans, in 1944. Our Flat Canvas Option- When you purchase a flat canvas you will get just the image with approximately a quarter inch of extra canvas surrounding the image. This option is good for collectors who just want a document of the cleaned image on canvas. The Flat Canvas is suitable for framing but will probably need a matte and glass to finish a framed presentation. Our Synthetic Vinyl Option- When you purchase a print on this NEW synthetic vinyl, you will not only get the same great re-mastered image, but you will be able to get it cheaper than any of our other printing surfaces. The vinyl prints just like paper and you will be able to mount it, and frame it just like any other print. A real breakthrough for those of you who like your art BIG! Our Un-Stretched Option- When you purchase an un-stretched print from Virginia Bader you will get your image and a colored border surrounding the image. This colored border will enhance the image when it is stretched onto stretcher bars and will be seen on the edge in order to accent the printed image.